So a few weeks ago I decided to take up archery. Sure, I hadn’t seriously shot a bow since 7th grade Kenny Guinn gym class (Mr. Salas, I believe) but, like fencing, it’s a sport I can get behind and feel comfortable pursuing. Maybe I feel like a medieval vigilante (or a modern day one and have been watching too much Arrow on TV) but I figured I’d give it a shot (no pun intended). So Rasa helped organize it and I had a couple of friends , Simas and Lin, who also wanted to go and we all trooped off at the beginning of the month (we waited until the beginning of October since it was a new round and they had moved inside). The place itself was in the basement of a gym and fairly low-tech. I’d only been in one archery club/shop before, in Vegas, where I had wanted to take lessons but timing never worked out. There, though, it was a shop with a bowling alley like shooting range in the back. You walked through a retail display space featuring all sorts of bows and arrows and various other accoutrement and then there were shooting lanes with targets set up. Walking into this place, it felt more like an archery club, which was cool. There were several people shooting at various distances and the guy in charge, Vlad, had a number of certificates and trophies scattered around. There were dozens of bows hanging along the walls, but they had the appearance of being owned and merely stored there, not for sale. We introduced ourselves and I hit my first hiccough. Vlad doesn’t speak English. Now, when Rasa had called to arrange this, he (or whomever she had spoken with) claimed this wouldn’t be a problem. Considering at the point of initial contact I didn’t know if any Lithuanian speakers would be joining me this had been a point of major concern. Now, I’m not so naive as to think everyone should speak English but I do try and accommodate myself (or at least, prepare if I’m going to have to make do with sign language and google translate). I understand this limits me, but I’m resigned to that. What I hate is being taken advanatge of because of it – like a few months ago when I went to get my hair cut, made an appointment and specifically asked for a stylist who spoke English. When I got there, I was handed off to a woman who spoke no English and it made the 45 minutes of the cut slightly uncomfortable since I couldn’t explain what I wanted and she couldn’t tell me what she wanted. So I was a bit surprised when Vlad thought my not speaking Lithuanian might be a problem. He turned to Simas to explain things and then had Simas translate to me. It was awkward to say the least. And the thing was, he didn’t have to. Not that the langauge wasn’t a problem, but most of what he was saying I could follow along simply by observing his actions with the bow. And I wasn’t far off in my assessment. It really is more like a club. In fact, I actually ran into someone I knew, a former bartender from Shamrock. He had a beautiful compound bow under his arm. We exchanged greetings and when I jokingly suggested that it was great he was there, he could help me, he smiled and said “no” and even though i’ve seen him there several times since, never another word. No one talked to us. We’d see a few of the same people (lessons are Tuesday, Wednesday, Thursday from 6-8pm) but while everyone talked to everyone else, no one talked to us. That first day, we shot and generally, I sucked. Vlad would correct me and I’d do it right for a time or two and then slip back. It wasn’t easy. But I was keeping at it.Two weeks ago, I was with Lin getting my hair cut and colored (again with someone who didn’t speak English, but this time I knew it and Lin was going to be therein case we needed a translator) and we were talking about archery. I realized a few things as we talked. One, I was looking for more than a physical outlet. I was looking for a social outlet, someplace where I could have social interavtions without being ‘the teacher.” Also, it was frustratting having someone talk at you becuase of the langauge barrier. Vlad would share stories and comments, things I couldn’t understand (and often it felt like it was at my expense – Not that it was, but it certainly felt like it). So that night I skipped going. I had work to do and just wanted to stay away for the night. I really had to think about what I was doing and why I was doing it. It was one of the rare times since moving overseas I felt really like an outsider. I hadn’t realized how much I was looking forward to a situation of being informal and friendly. Even pub quiz (which I put on hold to pursue archery) doesn’t do it since my “team” consists motly of students and former students (if /when I go back, I’ll see if I can join another team where I can just be social and not have to organize everything). Lin pointed out to me that this was a particularly “American” way of thinking. Truely, I had taught this concept in Pop Culture class, that Americans tend to particpate in activities for the social aspects as much as any other reason. I decided I’d finish out the month (I’d already paid for it) and see how I felt come November. When I returned on the following Tuesday, I had to learn how to string my own bow (Simas and Lin showed me) and we changed over from practice to a full ten meter distance. We also started keeping score. I sucked. I was shooting 155/300 while Simas (who is a natural) shot 275 and Lin was at 221. And Vlad was correcting my posture and positioning as always, moving my fingers and and talking to someone else. On Thursday, though, something changed. 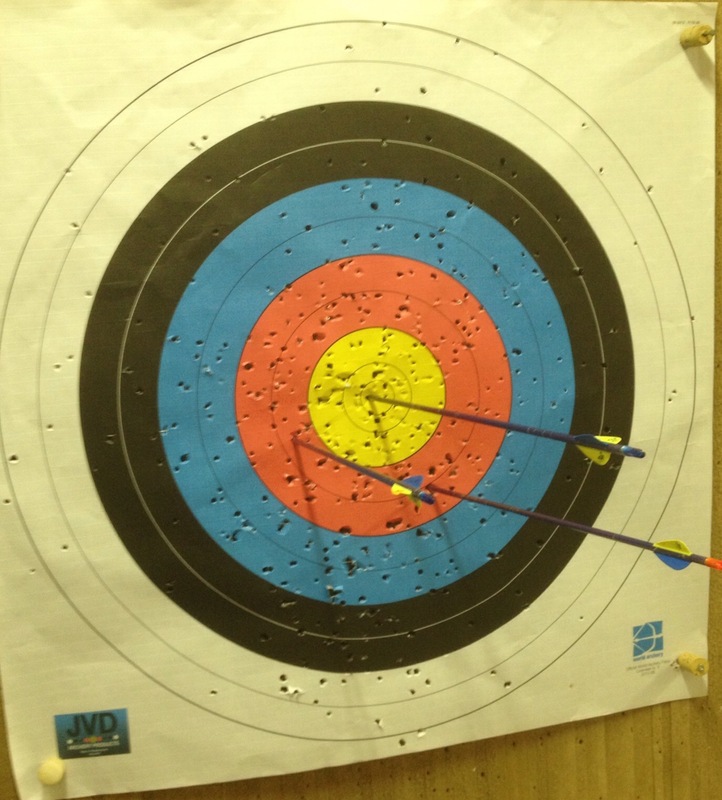 We got smaller targets and my score improved drastically (245). We learned about “dueling” and other people shooting came over and said hello and goodbye. It wasn’t let’s go have coffee conversation but it was a step forward, at least for me. So I’m still where I was, still evaluating. But I’ll go Tuesday night and keep my head straight and my string aligned and try to beat my previous score. Wasn’t Mr. Salas also the AV guy we ran cameras for at a couple school events? Dueling is unknown to me. What does that involve? Teddy did better on a smaller, physical target like a cheap halloween bat rather than the large paper target. I think it is an “aim small, miss small” psychology, but may just be that bats are more interesting to shoot at than circles. 245 is a respectable score. Correct form is the secret to repeatable results. If you always use the same stance, grip, hold, and release, then the groups should be small. After that you develop the aiming ability to put that group where you want it. We’re still at the medium size target range. Be fun to shoot at small 3D targets though. Dueling is three arrows a side, high score wins 2 points, draw is 1 point apiece. First to 6 wins. And Salas might well have been AV… I do remember running cameras and TV trolleys!